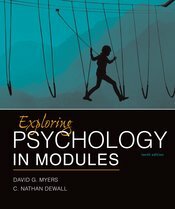 Exploring Psychology in Modules’ new openers go beyond the typical table of contents to offer a strikingly visual, highly memorable preview of the chapter’s content milestones. The evocative, intriguing images draw students in immediately, and provide a structure (scaffolding) for learning the concepts to come. Preview the chapter opener from Modules 7-9, Consciousness and the Two-Track Mind, below. Click the image above to enlarge it or download the opener.